Welcome back to Our Creative Corner. Laura here bringing you our first Top Talent! 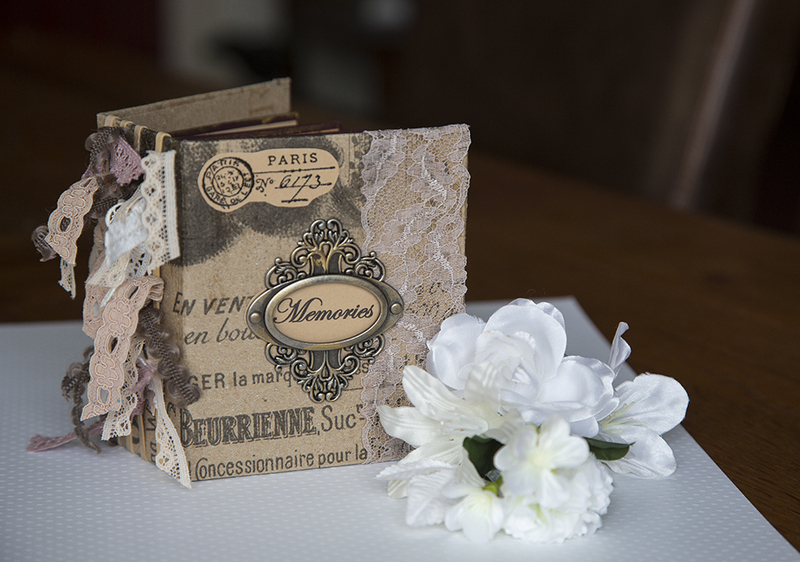 Today we are so happy to welcome Paula from Ephemera's Attic. 2. How long have you been crafting and what made you start crafting? I’ve been crafting most of my life really, I’ve always drawn and painted, dabbling in and out quite a few other crafts over the years, macramé (anyone remember that!) candle making, encaustic art, silver smithing and jewellery making. 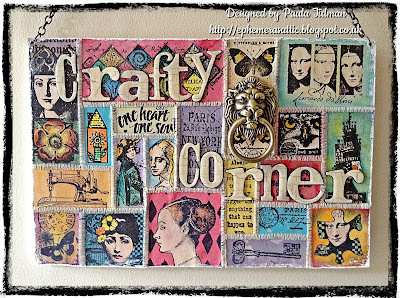 I started paper crafting a few years ago and instantly fell in love with stamping and altered art. I bought a sewing machine last year to use in my paper crafting, but now I have become addicted to fabric too and I love incorporating stamping in my fabric creations and just recently I’ve started patchwork & quilting. I can’t imagine not crafting in some form or another as it’s integral part of who I am, I just wish there were a more hours in the day to fit it all in. 3. What do you enjoy most about stamping? There are loads of things, but probably the versatility, that stamping has to offer, I love to stamp on fabric and TAP(transfer artist paper)as well as paper. 4. If you could only use three craft supplies for the rest of your life, what would they be? 5. If you have lost your Mojo, how do you go about getting it back? My mojo does seem to desert me quite often and I find visiting my favourite blogs really inspiring, it helps to get my creative juices flowing again. There are so many talented bloggers out there sharing their ideas, the crafting world is such a friendly place. 6. What is the most satisfying/exciting..... the designing or the end result? Most of my projects seem to evolve along the way, and are never how I envisaged them in my head, I tend to start with an idea and usually go off at a tangent. I enjoy both the creative and usually very messy process and the end result. 7. How would you describe what it means to have an "Artistic Outlook" on life? I’ve always felt the need to be creative from a very early age and if anything the feeling has intensified the older I get. Even when I’m not crafting I’m thinking about future projects and can get very grumpy when I’m not able to craft. I usually manage to sneak some sort of crafting with my when on holiday too, obsessive or what LOL! 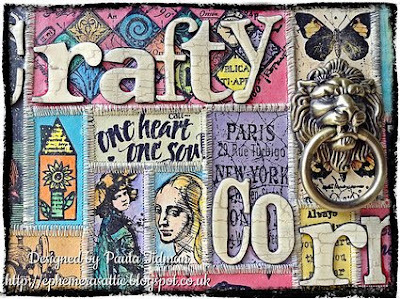 .......And now we shine the spotlight on this fantastic sign Paula made for her 'Crafty Corner' as her crafting area is affectionately called. Thank you so much Paula for being our 'Top Talent' today and sharing such an inspiring creation with us. We all hope you will come back to see us on the 1st August when Alison will be presenting her challenge for all of you.... See you then! Welcome back to our mid-month dose of inspiration for our Captured Memories challenge. You are all so creative and we are seeing some wonderful entries into this challenge! We hope the rest of you will find the time to play along with us for this challenge. You can find all the main details, challenge rules and the linking feature in this post. My memories piece is actually a very recent photo. A couple of weeks ago my husband and I had a little get-away to Sanibel Island on the west coast of Florida. I took the photo on the beach, printed it in black and white and then aged it with Vintage Photo distress ink. 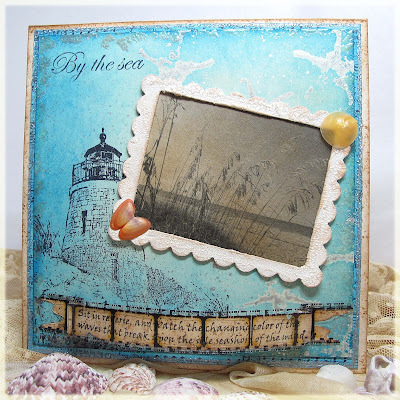 I made a sea scape background using Artistic Outpost stamps and added a wonderful verse...a great memory of a wonderful escape weekend. I created a mixed media necklace using a childrens photograph that (very likely) shows my great-grandfather and his brother. I have a lot of fond memories for my "Opa-a" (as I used to call him when I was little), whom I had the great luck to know, as he got 93 years of age. He used to take me to his study, crammed with lovely old furniture and paintings and his fantastic old style communications receiver with the names of all the great cities in the world on it....it always felt like I had entered a world of its own. Our very own secret place. When I saw Linda's challenge I got my box of family photos out and had a great trip down memory lane. My Brother lives 5,000 miles away, so I don't get to see him very often these days and I just love this photo. It brought back wonderful memories. The sentiment is just so true for the two of us and really makes me smile. I made this cabinet card for his next birthday, hope it gives him a smile too! The deadline for this challenge is Sunday 28th July at 11.55pm. The winner and Top 3 from this challenge will be announced on the 8th August. The winner's Top Talent interview and creation will be on the 22nd September. Make sure you join us again for those dates and remember that the next challenge will go 'live' on 1st July when Alison announces her theme. Come and see what surprises are in store for you and where your next OCC challenge journey will take you! Welcome back to Our Creative Corner. Jenny here to bring you all the winners from last month's 'Recipe' challenge. The black and white cover caught my attention immediately, but it was as the inside pages unfolded that all the magic became apparent. 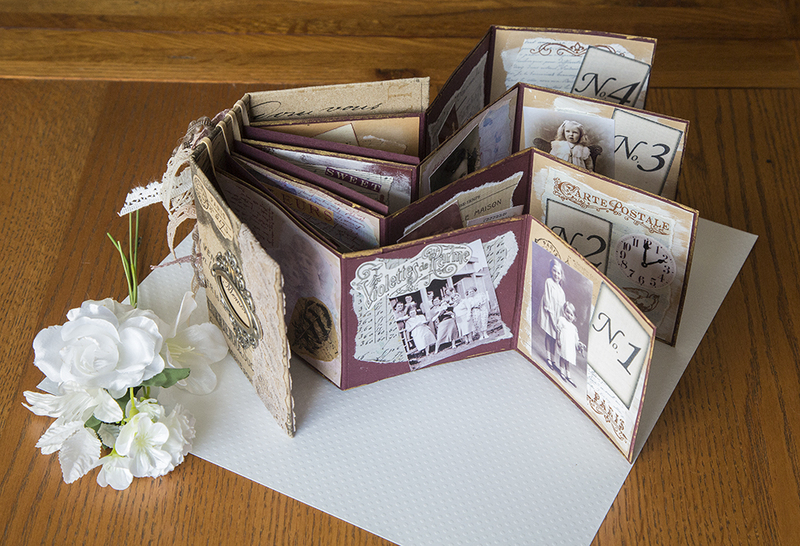 A stunning choice of images was perfectly complimented by stamping, stitching, layering and lace, and it was all held together by the monochrome colour scheme. This was the first time I had seen Kasia's work and I can assure you, it won't be the last!! 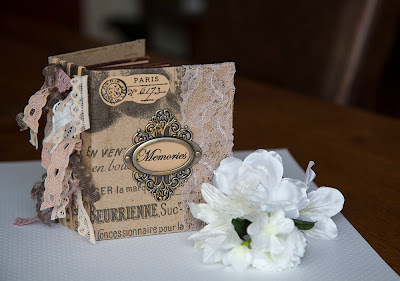 As a huge fan of mixed textures I was drawn to the leather effect embossed cover, clay heart, fabrics and metal elements, all of which combined to create a beautiful little book complete with leftover paper pages. Again, I will be watching out for Ana's creations in future. I love that Jessica embraces the use of colour with a passion and has truly transformed this... (no, you'll need to hop over and take a look to see what it started life as). The little polymer clay flower, the lace and the ribbon all helped to make this dress fit for any princess. Alexa entered a couple of scrapbook layouts into the challenge and this one definitely needed a closer look. Can you believe those stamped bees are covered in beeswax, the gilded honeycomb is good enough to eat, and I love the personal and poignant sentiment. 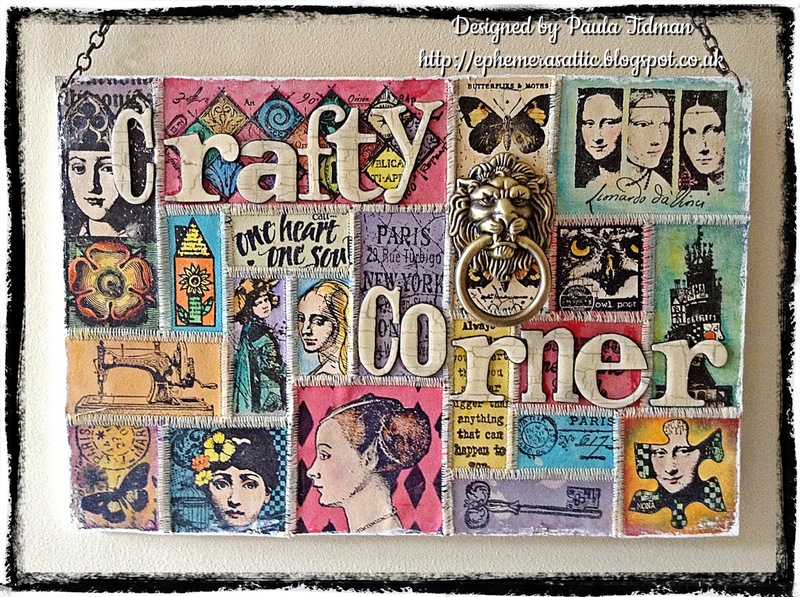 Well done to the latest 'Our Creative Corner' Winner and Top 3! Feel free to grab your badges from the sidebar - we hope you will proudly display them on your blogs. Don't forget, the 'Captured Memories' challenge is now in full swing. Take a look at what it's all about and get creating/entering. 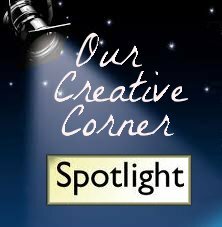 Who knows, you too could be joining Kasia in our 'Winners Corner' next month and be invited to create something for a special spotlight feature as a 'Top Talent'!! Greetings friends! Linda here to welcome back to a brand new challenge at Our Creative Corner. We had another fabulous array of entries for Jenny's Recipe challenge and we have had a terrific time visiting all your blogs and drooling over your makes. Thank you so much to everyone who played along with us! Jenny will be back with the winners' post on July 8th so be sure to stop back that day. Our challenge theme for July is Captured Memories. Memories are fleeting but photographs help us hold dear those special people and times in our lives. Our project this month is for you to share a special memory captured in a photo. All types of art are welcome: cards, tags, canvases, mixed media, etc., but your project MUST INCLUDE A PHOTOGRAPH. (NOTE: Your photograph does not need to be a personal photo. A vintage photo from the internet is also acceptable.) Let's see how our design team has shared their captured memories. Getting this card right was very important as it was destined for my wonderful husband. Still on my 'Italian' odyssey, I was transported back to a very happy family holiday on the Isle of Wight. We visited Queen Victoria's holiday home, Osborne House, built in the Italianate style. Obviously we took loads of photos and the one on this card lent itself perfectly to getting an 'Instagramatic' style photo treatment. 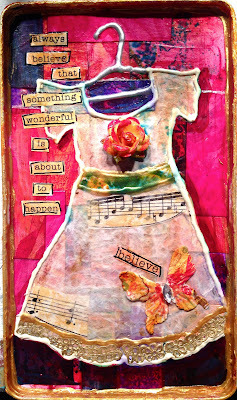 It set the colour scheme and style for the whole card, and taught me a lot about various mixed media products. For the 'Memories' challenge, I have returned to my collection of family photos which are very dear to me. I have chosen a photo of my paternal Grandmother when she was approx 19 years old. I have previously shown her in a blog post when she was a child and it's lovely to look at her over the years as she becomes a young woman, wife and mother. This is very much a mixed media piece and you'll never guess what the base looked like before it had a make over! Despite always enjoying making albums I decided to make something very different here. I made a Memory box for my daughter. Her style is very pink and feminine with a passion for vintage items. 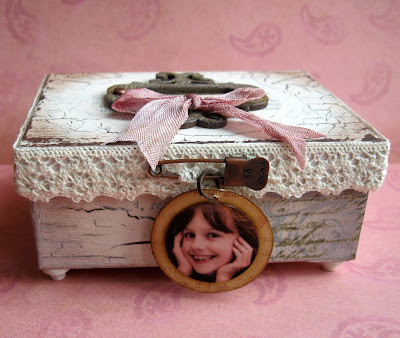 She never throws anything away, claiming that everything she keeps is a treasured memory - but at least now she has a vintage style box where she can keep those little treasures. Loved the idea of Captured Memories as I really enjoy making mini-albums and thought this one was so easy to construct before the fun part of decorating it began. Its really amazing what you can do with an empty dishwashing tablet box and four rubber bands! Don't believe it can be that easy? Come on over to my blog here and find out! The winner will be invited to appear as 'The Top Talent' here at OCC, have a short interview so we can find out all about them and there will be a 'Spotlight' on a new project they have created. This will take place on September 22nd. We have a page on this blog called 'Winner's Corner'. The winner's name will be featured on this. Remember, Jenny will be back on the July 8th to announce the winner of the 'Recipe' challenge, and on July 15th the rest of the Design Team will showcase their creations for this month's challenge. This challenge is open until 11:55 pm Sunday, July 28th. Thanks for visiting. I hope to see your sample shared here very soon.